Foxtel has taken the wrappers off a new, dedicated, 4K live channel, heralding what the company claims is the “next wave” of change in Australian television. Calling it an Australian first, Foxtel said the technology is a live 4k experience that lets viewers watch sport, documentaries and movies through Australia’s only guaranteed 4K satellite signal. Unveiling the channel at a Sydney event, Foxtel CEO, Patrick Delany, said innovation is in Foxtel’s DNA. “We have continuously redefined entertainment for Australia putting us at the centre of connecting subscribers with the sports and the shows they love," he said. According to the company, Foxtel in 4K will launch in October on channel 444 and will come as part of a Foxtel Platinum HD or Foxtel Sports HD subscription for customers with an iQ4. At launch, the channel will start previewing 4K content, including live sport, documentaries, concerts and more. Over the next 12 months, Foxtel will then expand the selection of unique 4K content to its subscribers. The news comes as Foxtel announced the arrival of the new iQ4 set top box, designed to be continually upgraded with newer, smarter features. The new iQ4 will enable subscribers with a compatible 4K TV to access Foxtel’s new 4K channel and enjoy Australia’s entertainment and sports service in HD and 4K UHD. According to the company, the iQ4 marks the start of a new wave of innovations for Foxtel to improve the value of a Foxtel subscription. The iQ4 combines satellite delivery; 4K programming via the 4K channel, along with a host of other linear channels, alongside a library of TV and movies to stream On Demand via the internet. As reported in CMO late last year, Foxtel upped its game in the streaming device market after unveiling its ‘plug and play’ Foxtel Now device, only weeks after the launch of Telstra TV. 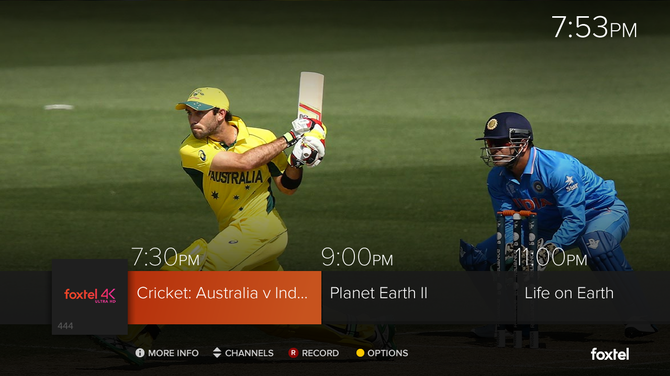 As well as providing access to Foxtel Now in HD, the device offered broader access to a host of programming streamed instantly to consumers, live or on-demand. It also streamed free-to-air channels via a built-in free-to-air tuner.